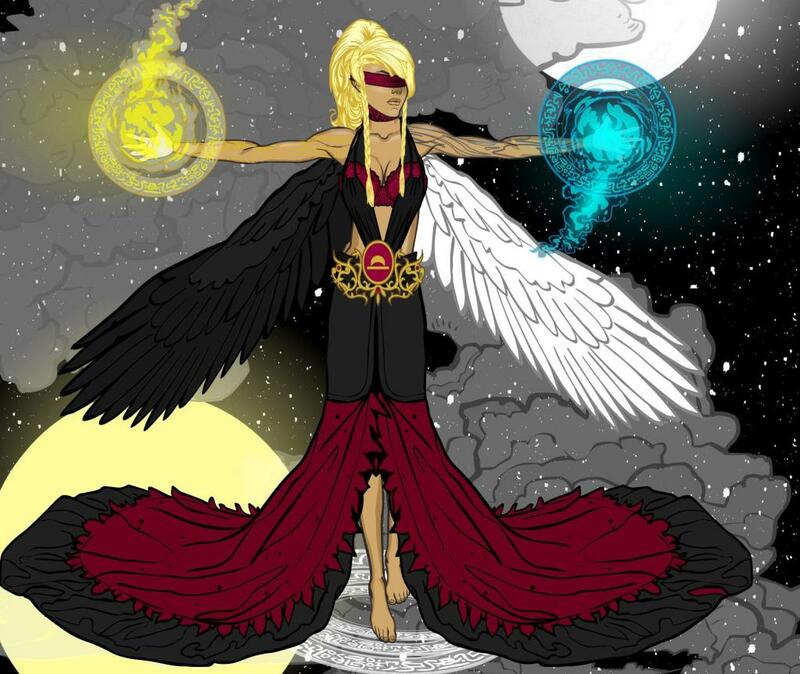 Many thanks to everyone who entered Character Contest 74 - Libra! This was the last of our Zodiac challenges, and I appreciate everyone's patience as we worked through its highs and lows. Before getting to our Finalists this week, I wanted to be sure to highlight the great work of Mark's "Zodiac Commandoes", his -- and I quote him here -- cheap GI Joe knockoffs. I've had a lot of fun seeing each new team member every month, and it's great to see the entire squad assembled. Thanks for the good times, Mark! I love the drill gun she's holding, that thing's awesome. And now, our other finalists for this week! Note that as usual, you can click on most of these images to see it at the original, larger size. I thought Cliff's Yen Yang had excellent technique and created a fun, visually interesting image. dblade always brings the Awesome, and this week is no exception. 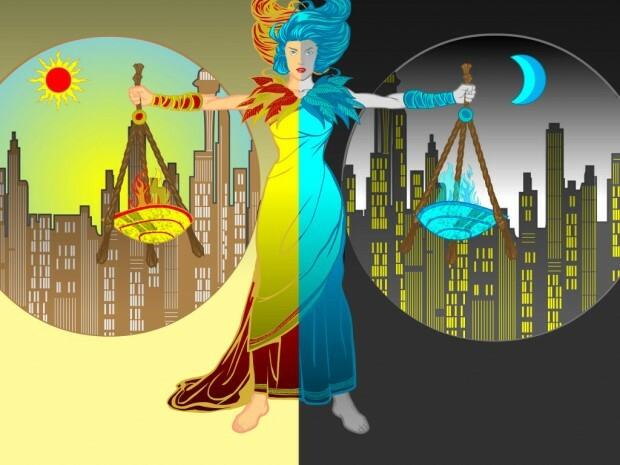 Called "Fiery Judgement", I love the play of cool blues against angry reds. A great composition! Dimmortald's "Despoine" shows tons of technique and an interesting dichotomy. 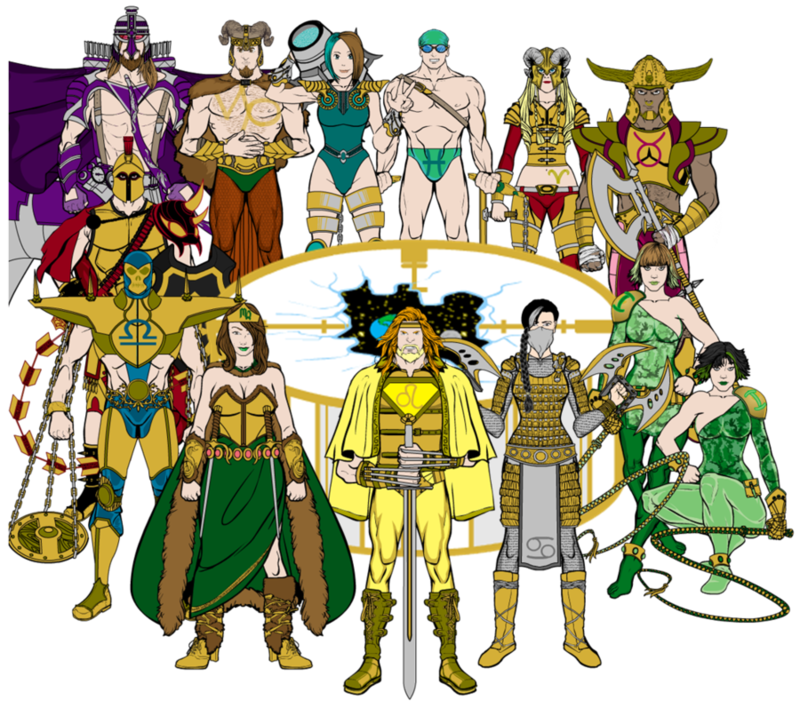 Frevoli, like Mark, has assembled all 12 of his entries into one really cool team shot, which I now share with you. Gendonesia's "Leebra" shows how you can use different tones of the same color to excellent effect. I love the subtle movement of the figure. You don't have to do crazy, completely out of left field things with these concepts -- sometimes a straightforward execution of the main idea done very well is awesome all on its own. As in this case. Kaylin88100 had two entries this week I wanted to highlight. 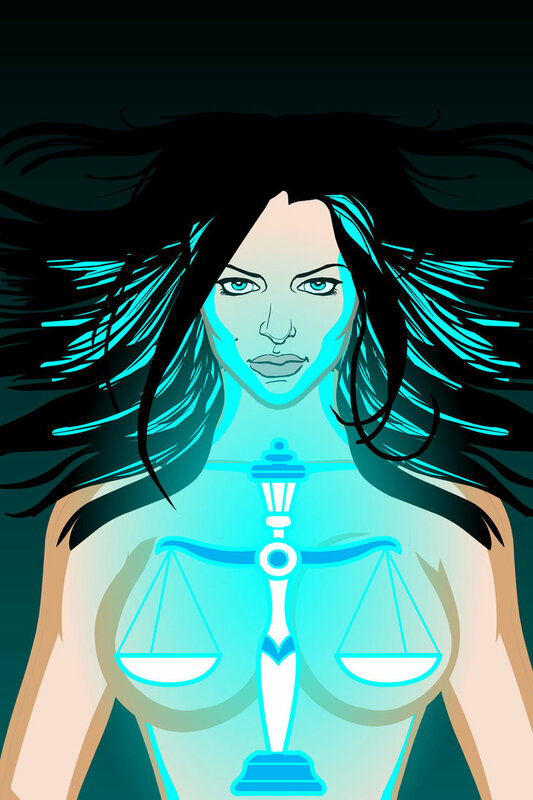 The first is simply titled "Blue Libra" and I think has a lot going for it, from the contrast of the warm-toned scales with the cool-toned surrounding elements, to the great use of the seated figure, to the subtle touches of theme and shadow. 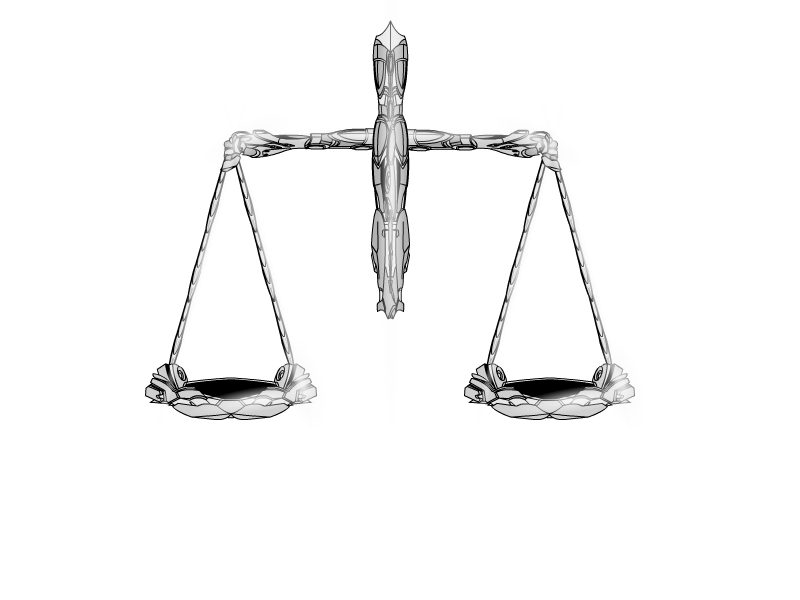 Her second entry is a study in balanced contrasts (for Libra, the scales, get it?! ), titled "Love and War". I like both figures, and was happy to see the progression of the positioning of the female character's hand. The first two attempts were not quite right and would not have resulted in being a Finalist, but I think the final solution works great. Excellent sticktoitiveness there! I liked kwnos' blue highlighting here. I have nothing fancier to say, I just think it's pretty. 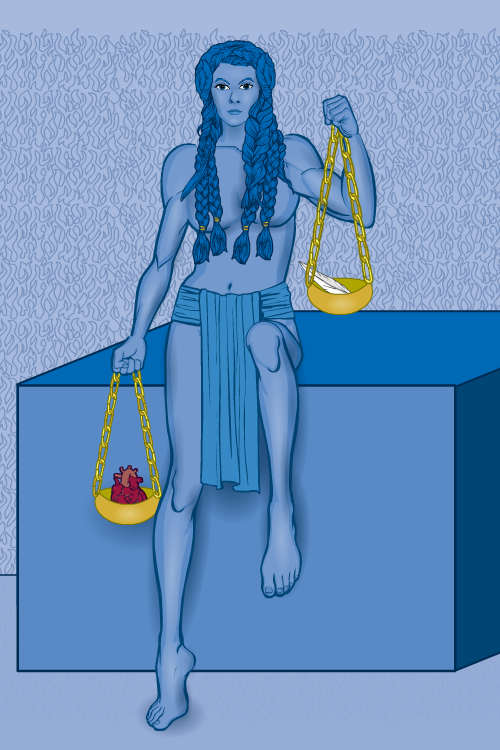 Similarly, I find myself unable to look away from the hideous man-troll in Kytana's "Libra". I mean, I know it's contrasting images and all, but that guy is awesomely ugly. I can totally imagine running into him in a dark alley somewhere and -- this is probably TMI -- undoubtedly wetting myself in terror. Newerlie's "Libra" is another impressive composition with a lot going on. Yet it's all pretty clear and easy to understand, as well as being visually appealing. Good job on this one! Like dblade, you can always look forward to PapaKrok's entries. 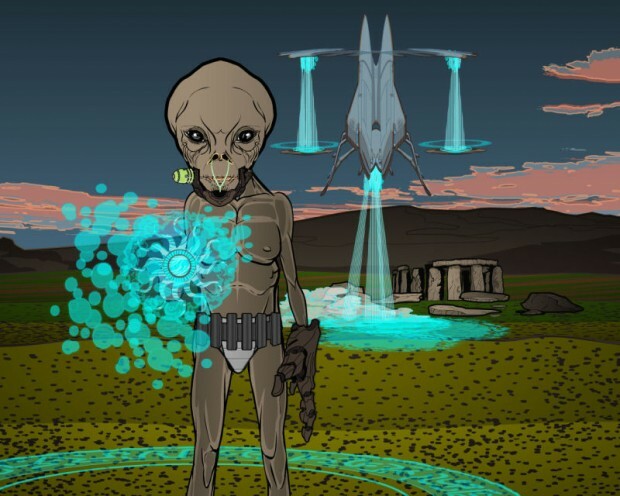 I love the way the ship forms scales in the background, and the alien in front has that patented awesome PapaKrok "ick" factor. I liked Skybandit's use of color and composition on this one as well. Very cool. 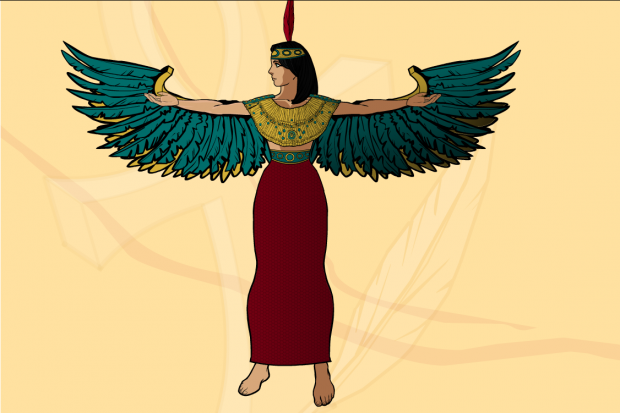 SpellCheckingQuill has a great profile view in this mythologically inspired illustration, titled "Ma'at". I found Tarkabarka's "Eriel" quite moving. Finally, Trekkie has another great entry in the robot-construction series that I love. Which brings us to our winner this week. It was a tough call, but ultimately I went with ... Gendonesia! I thought it was the best expression of the sign and was easily one of the most visually arresting entries. Great job! Let me know what you would like for your prize and I'll throw it on The List. Thanks again to everyone who entered and special congratulations to all of our Finalists! The Zodiac contests were fun, and I'm glad I did them, but now that they're over I'm glad to see them go. Next week we'll open it up a lot more and give you more creative control! 18 Responses to Character Contest 74 Winners! Excellent choice! I hadn’t seen Gendonesia’s “Leebra” the first time around so it was a pleasant surprise. Very nice use of color and it captured the sign’s essence nicely. Great work, everyone! If I find some time I will try to comment on some others that I enjoyed. Congrats, Gendonesia! Love the basket-weave effect on the scales. The colors and tints sell the concept. @All: Really tough contest theme. Glad a lot of people stuck it out for all twelve. @Mark: Best overall. A unified concept with strong characters. @Frevoli: Likewise, a great pantheon. Frevoli – Libra2: Stylized. The garter is a nice touch. Kwnnos – Libra3: Love the light reflecting off the face and hair. SpellCheckingQuill – Ma’at: Worthy of a pharoah’s tomb. whoa, thanks for your choice Jeff! and congratz to all finalists, what a great pics! First of all i give a great gratulation of all finalist. I think this is the first time to i 100% agree with Jeff. I like all the pictures what he choose. MLS: Yeap this is a great group. The 12 unique and random looking char gives we a great full thing. And few word the character. The drill gun and the utility belt is also awesome. I like the pose so natural. My only visual problem is the Uzi stock is the wrong side of the arm. Cliff: I really sorry to i don’t my opinion in the contest. I think i see any picture, but i missed this. I really like this picture. I love the pose, and the idea behind this picture. 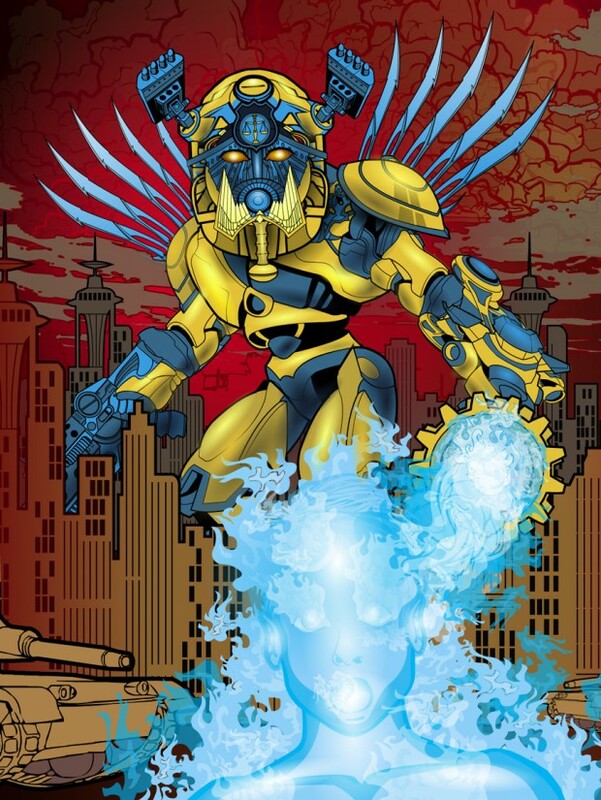 I think the coloring, and the shading give we a full unique looking char. I have got one visual problem, the red face paint is so much for me. Dblade: I really like Dblade works. He gives we usually great pictures. Very awesome item use, and unique approach with every character. This picture is so complex, and so difficult, but not annoying. The whole idea is great. I really can’t wrote more. I very glad to write good thing with that awexome picture. Frevoli: I know how hard to make a group picture. But the chars are visually not strong, but the whole idea behind the characters is intresting. Very hard work to made a group pictures, and this picture is give we a full complex thing. Great work Frevoli. Gendonesia: First i gratulate for the win. So my problem this personally (don’t think wrong for me) first view i can’t see any unique, but if i see more particulary i see the little but important things that gives me the feel “this is awesome”. I like the coloring, the pose, the unique idea. Great work Gendonesia. P.s. : I glad to help you. I like the idea behind the first picture. The coloring work is perfect. I wrote in the contest. I think the legs are a little bit weak for the body, but Jeff seen an other thing what i really now seen, the shadows. I nothing wrote more than i first wrote the War and peace picture. The female hand is now more perfect for the picture. Kwnos: I 100% agree with Jeff the unique blue light effect awesome. Not an hard picture but the effect sell me the picture. Great work Kwnos. Kytana: I think this is my fewest comment. Great work Kytana. I wrote what i think this picture. I’m glad you finalist with these picture. Newerlie: This is a great picture. Not complex, not hard. But the picture have an unique thing what i really hard to wrote it. I like the coloring and the idea behind this picture. My only visual problem is the body it’s to thin or my eyes lies me… I don’t know. I really like this picture. Great work Newerlie. PapaKrok: See what i wrote for Dblade. 😀 – So without joke. This is an absolutly full and complex and visually strong picture. The little things nake the picture a full composition. We don’t missed in the parts. So i don’t write more good thing because i don’t find the perfect words. 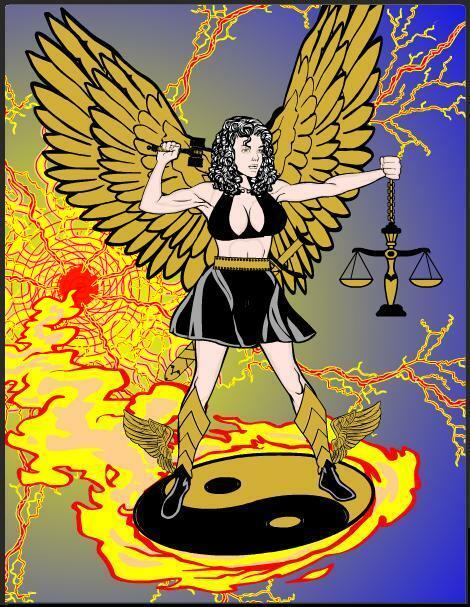 Skybandit: Great coloring and great idea behind this picture. Visually not so strong but have an unique looking. SpellCheckingQuill: I wrote my opinion in the contest. I can’t wrote more. Great picture and great work SpellCheckingQuill. Trekkie: So this is a very important picture. Trekkie usually show we if we have a little imaginery we made or make everything with parts. I don’t know wich more hard make a unique pose or make a robotic item or animal. Great work Trekkie i usually drops my jaw down when i see your robotic works. And my picture: I made a lot of angel in the last month. This is personaly one of my favourites. I don’t know why i like it. Not an hard pose, not an unique coloring, but i really like it. I like the emotional aura what shown in this picture. I’m really glad and happy to Jeff choose this picture. I dont want so many write like Tarkabarka, so Grats the winner(s). Exelent work. I like all picture here and i hope the Zodiac Commandos protect us good. Btw i think you cry when you read all of this what i wrote. Really sorry if i wrote a lot of english i made a lot of mistake and grammar errors. I hope anyone understand what i want to wrote. Thanks everyone for your support. 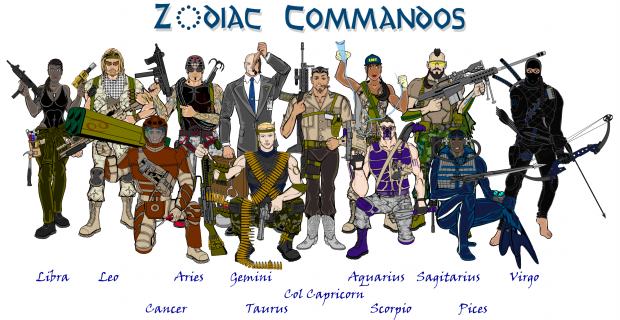 The Zodiac Commandos have been fun. It’s given me a chance to rehash a lot of great action figure memories from my childhood for inspiration. Congratulations Gendonesia! A worthy final entry in an entertaining competition. light effects are my life!!!! 🙂 thank you so much!!!! Congrats Gedonesia! Great picture, I love it. Good job everyone else, great stuff in this contest and I’m glad I got a finalist mention. MLS: Like the clothes, not so sure about the face. Overall I love the team and my favourite is probably…umm…Aquarius. Dimmortald: Love the concept, like the execution. Only things I’m not quite so sold on are the face and the hair. Not quite sure why, they just don’t seem quite as strong as the rest. Frevoli: I like the team shot, you can tell who’s who which is always good. I’d have liked to see Libra on his(?) 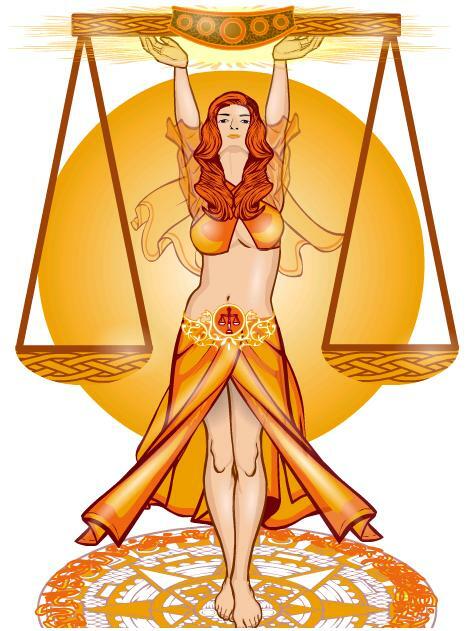 own though, as it was the Libra contest. Kwnnos: Like it 🙂 Nothing else to say about this one. PapaKrok: Like dblade, I think you make great scenes. I also like the alien-ness (is that a word? Oh well, it is now) of the alien. SpellCheckingQuill: Love the use of light and dark in this. I also like the simple background that helps the figure stand out. This one stands out from all the other finalists, because of its simplicity. I like it! Tarkabarka: Jeff is right, it’s very moving. And it tells a kind of story as well, which is good. Love the expressions and the concept. Thank your kind word. Now i know the other meaning of the word moving i really proud. Dimmortald – Sorry i miss you in my review. – So this picture is so complex. I know what hard to make this type of picture. I think this is a good picture, very intresting using of the items. If i make i use more masking. – I have got one visualy problem is the blue hair. Great work Dimmortald. Dangit, everyone is getting sooooo daaaaaamn gooooood. [In my opinion] this has created some of THE BEST things to ever come from HM3, Dblades blew me away, but the rest, where ALL awesome, not a single one was lacking anything.